You can get a 10% discount by typing "IDES" where they ask you for the coupon code. If you are a non-mathy guy, but want to understand sabermetrics better, then a huge thumbs up for this book. If you are pretty much comfortable with sabermetrics, but still not there yet (you haven’t run any of your own studies), then a regular thumbs up. I got your book today and it's fabulous. Your clear and patient style, your ability to put yourself in the shoes of the average fan to take them further, and your systematic approach are just what I was looking for. 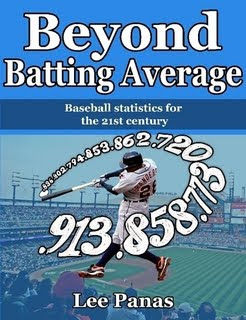 if you are interested in learning more about the wonderful world of baseball statistics, I highly recommend this book. With his book, Lee gives the reader a step-by-step guide through how stats were developed and how to best apply them. I rarely review a book, but this is one that I think merited that. It is a solid addition to anyone's library. The introductory baseball statistics reader who wants to learn more and be able to start engaging in conversations about metrics would find this most useful. Lee's straightforward approach and knowledge will make it a good resource for those who are just getting into sabermetrics.